Pineapple is a sweet, nutritious fruit that can help you meet the recommended five or more servings of fruits and vegetables per day. Eat it by itself as a snack or as part of both sweet and savory dishes. It’s not just a tasty fruit, though, eating pineapple is great for your health and well-being too! Keep reading to learn about just what a nutritional powerhouse it is. When it comes to eating pineapple, fresh is best. 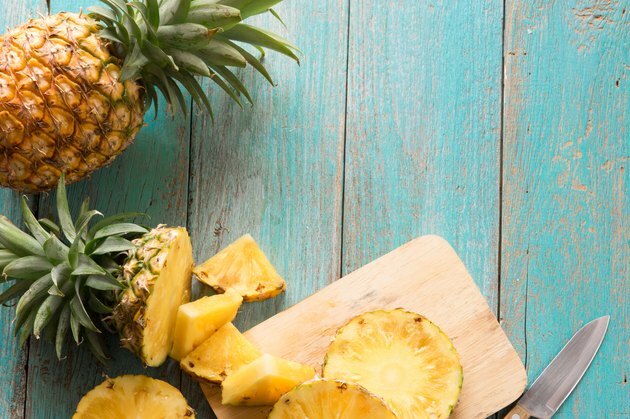 There are still some health benefits to eating canned pineapple or pineapple juice, but fresh pineapple is definitely going to give you more bang for your buck. It’s important to remember that when tracking sugar, the sugar from fruit is natural sugar, not added sugars. Added sugars are used during processing. The calories in pineapple are comparable to a serving of most fresh fruits, including a medium apple or orange or serving of strawberries. You can track all of the calories you consume using an app like LIVESTRONG.COM’s MyPlate. Like most fruits and vegetables, health benefits come from the combination of the nutrients they contain. Pineapple is packed with vitamins and nutrients that make it an especially powerful fruit with the potential to improve health. First off, pineapple is an excellent source of vitamin C. One cup of fresh pineapple chunks will give you more than 100 percent of the daily value of vitamin C for women and 87 percent for men. That can provide a boost to your immune function and help shorten the duration of colds, according to the National Institutes of Health. And the Linus Pauling Institute indicates it may help reduce high blood pressure. Vitamin C in pineapple may also help lower your risk for heart disease, gout, cancer, lead toxicity and cataracts. The vitamin C and beta carotene in pineapple are essential for skin health. The glow and youthful appearance of skin starts from the inside out. Collagen, a protein found in skin, can break down and make skin look dry and dull and contribute to wrinkles. Vitamin C helps your body make collagen and repair skin, according to a 2017 review article published in the journal Nutrients. Beta carotene is helpful in protecting the skin from ultraviolet light, which can also damage the skin. Pineapple can aid in weight maintenance because of its fiber content. You’ll get 2.3 grams of fiber in one cup of pineapple, which is the same as one medium kiwi fruit. Fiber helps you feel fuller longer and contributes to better weight maintenance by reducing total energy intake. The Academy of Nutrition and Dietetics indicates fiber is essential to promote a healthy weight. The average intake of fiber for most Americans is 15 grams. That is much less than the recommended daily intake of 25 grams for women and 38 grams for men. Pineapple is 80 to 89 percent water, according to 2010 research published in Nutrition Reviews. Good hydration is essential for the health of your kidneys, skin and eyes, and it helps with cognitive functioning, athletic performance and regulation of body temperature. For those who don’t like to drink plain water or who choose sugar-sweetened beverages over water, eating fruits high in water content (like pineapples) can be a great hydration alternative. Pineapple contains an enzyme called bromelian that is largely studied for its effect on health. The National Center for Complementary and Integrative Health concluded bromelain is beneficial for sinus inflammation and may be helpful for osteoarthritis and muscle soreness. Bromelain is found in the stem and in the flesh of the pineapple. It is only found in fresh pineapple because the canning process destroys the bromelain in any canned variety. Pineapples are usually picked ripe. Choose a pineapple with green leaves, not brown. Look for skin that is bright, sometimes it will be green or even slightly yellow. If it’s dull, dry or looks old, put it aside. Turn your pineapple over, look at the bottom and press on the skin. It should be firm to the touch. Finish by smelling your pineapple. If it smells like a pineapple, it’s ripe and ready to eat. There are a couple of common methods used when cutting a pineapple. The goal is to cut as close to the peel as possible to preserve the flesh of the pineapple. Some individuals prefer a pineapple corer, which can core, peel and slice the pineapple at the same time, depending on the model. When peeling and coring a pineapple, always remember to handle the knife safely and to use a cutting board. The top, peels and core of the pineapple can be composted. Because it’ll take longer for the top to break down, it may be helpful to cut the top and peel into smaller pieces to aid in its decomposition. Twist off the top of the pineapple. Place the pineapple on its side and cut the top and bottom off. Position pineapple right side up and follow the contour of the pineapple, cutting away the peel. Repeat until all of the peel has been cut off. Cut the flesh into chunks. Although pineapple is delicious as a fresh fruit, there’s no law that you have to keep it in its original form. Its versatility in different types of dishes makes pineapple an ideal ingredient in cooking. Here are five ways you can try it. If you’re grilling slices (or rings), they can be placed directly on the grill. When you’re grilling chunks or wedges, it’s best to use a grill basket. 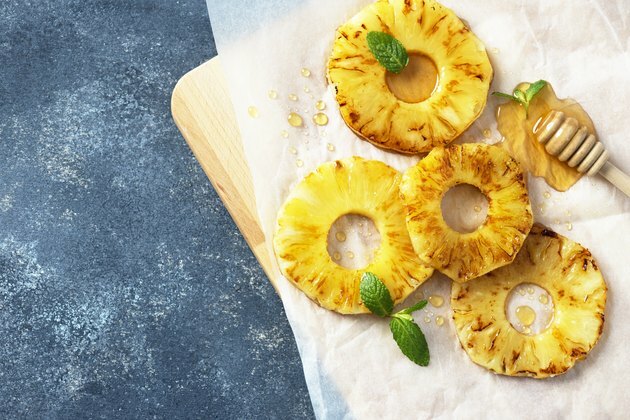 If you’re using a grill pan or outdoor grill, brush the grates with a small amount of canola oil or carefully spray with cooking spray to ensure the pineapple doesn’t stick. Place the pineapple on the grill over medium heat and allow it to grill for two minutes on each side. Sprinkle with cinnamon, or get creative with toppings and use other ingredients like fresh mint, basil leaves and lime zest. Serve with jicama chips or baked tortilla chips, or use it as a topping for grilled fish or chicken. Saute for five minutes and move to the side of the pan. In a small bowl, beat two large eggs and pour them into the skillet. Scramble the eggs in the pan. Add two cups of cooked rice and stir to combine. In another bowl, mix three tablespoons of soy sauce, one tablespoon of sesame oil and one minced garlic and add to the rice. Finally, stir in one cup of chopped fresh pineapple. Stir through and garnish with cilantro and one teaspoon of toasted sesame seeds. Pineapple smoothies are good morning, noon and night. The huge burst of vitamin C is great for a morning boost, as an afternoon pick-me-up or for skin repair at night. Pineapple upside down cake is a classic Southern dessert. It’s so easy to transform a ho-hum yellow cake into a colorful one fit for a dinner party. Spray the sides of a 12-inch cast-iron skillet with nonstick spray and add four tablespoons of butter and a quarter-cup of brown sugar. Heat over medium heat until the butter melts, and then stir to mix the butter with the brown sugar. Remove from the heat. Arrange six to seven pineapple slices around the pan and place a fresh cherry half inside each pineapple ring. Using your favorite yellow cake recipe, make the cake batter, pour on top of the pineapple and buttery brown sugar mixture and bake according to recipe or package directions. While the cake is still warm, place a large plate over the top of the cast-iron skillet and flip the cake over on the plate. Do you eat lots of pineapple? Do you eat them every day or just every once in a while? Did you know about all their health benefits? What is your favorite way to eat pineapple? Share your thoughts and questions in the comments below!